Having established an extremely high standard with the first three concerts in the current Sligo Music series, Con Brio hope to start 2015 in a thoroughly positive frame of mind with the Fidelio Trio this month. CONCERT: The Fidelio Trio get Con Brio’s 2015 concert series underway on January 23. They are (l-r) pianist Mary Dullea, cellist Adi Tan and violinist Darragh Morgan. So far, the 2014/15 Con Brio concert series has produced some rare highlights – in particular the outstanding pianism of Alexei Grynyuk in October. Con Brio will be hoping to maintain that standard over the remaining six concerts in the Series. Artists and ensembles to be featured include the renowned English pianist, conductor, composer and Head of Piano at the Royal Academy of Music Joanna MacGregor, English clarinettist Michael Collins who will be giving his third recital in Sligo (Michael will be performing with the Italian ensemble Piatti Quartet) and the Vogler and Callino quartets (the Callino will be joined by soprano Ailish Tynan). The Irish Chamber Orchestra lead by the irrepressible Katherine Hunka also make a welcome return. On this occasion they will be accompanied by the highly acclaimed young Hungarian cellist István Várdai, a past winner of the International Johann Brahms Competition, in a performance of Schumann’s Cello Concerto in A minor. The first concert of 2015 takes place on Friday evening, January 23 and features the Fidelio Trio. The Fidelio comprises violinist Darragh Morgan, pianist Mary Dullea and cellist Adi Tan. They perform diverse repertoire internationally, broadcast regularly on BBC Radio 3, RTÉ Lyric FM, WNYC, and NPR and in 2010 were featured in a Sky Arts documentary. Since their debut at London’s South Bank they have appeared at Wigmore Hall, Kings Place, Purcell Room and Royal Opera House, London, and at major festivals including City of London, Cheltenham Music Festival, St. Magnus International Festival, Huddersfield Contemporary Music Festival, Brighton, West Cork Music, Belfast Festival at Queens and National Concert Hall, Dublin, Shanghai Oriental Arts Centre, Centre Culturel Irlandais (Paris), Contemporaneamente Festival, Lodi and Palazzo Albrizzi, Venice, Johannesburg Music Society, Princeton University and MIT Boston. The trio are currently artists in residence at St. Patrick’s College, Drumcondra and, on completion of that assignment later on this year, they take up a residency at University of Birmingham. 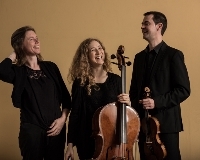 The programme for their Sligo concert includes Ravel’s Piano Trio in A minor, the Trio No. 2 in E minor by Saint Saens and a piece by prominent jazz bassist and composer Ronan Guilfoyle entitled A Little Blues.